Leaving aside Iran’s quest for nuclear technology, the lies and subterfuge which has gone on for 20 years according to the IAEA, the situation in Iran looks volatile. “The film shows the public hanging of Alireza Gorji, 23, and his friend Hossein Makesh, 22, in July in Broudjerd, Iran. According to official versions of the charges, they were put to death because they had behaved ‘immorally’. The truth, according to anti-government campaigners, is that the two men were among increasing numbers of political activists being executed by Iran on trumped-up charges. ‘Both these men had been involved in anti-government protests in their home town and everyone who watch the hanging knew this,’ said a human rights observer in Tehran. On Tuesday the UN General Assembly condemned Iran for human rights abuses and the video – filmed by a Revolutionary Guard, smuggled out by opposition activists and seen by The Observer – is rare evidence of Iran’s efforts to quell dissent. Amnesty International last year documented at least 94 public executions although many more are suspected to take place in secret – in September the authorities told a lawyer for Valliollah Feyz-Mahdavi, 28, that he had died after a suicide attempt in prison. Feyz-Mahdavi had been arrested for membership of Iran’s main opposition – the People’s Mojahedin Organistation of Iran. I wonder how the lickspittles in the nauseating President Ahmadinejad’s fan club will respond to evidence of his repressive nature? They will probably say it is all Western propaganda and Teheran is model democracy in the Middle East! Sadly, Ahmadinejad is like another Uncle Joe to some in the West and hero worship is rife. ‘GAZA (Reuters) – A ceasefire between Israel and militants in Gaza went into effect on Sunday and Israeli Prime Minister Ehud Olmert, promising restraint after early Palestinian violations, said the truce could help revive peacemaking. The agreement is designed to end rocket attacks and halt a crushing Israeli army offensive that was launched after gunmen seized a soldier in a cross-border raid last June. Olmert said he hoped the soldier would now be freed. Palestinian militants fired several rockets at Israel just hours after the start of the ceasefire. “We will show the necessary restraint and patience, certainly in the coming days,” Olmert said during a visit to southern Israel. The Israeli army pulled forces out of Gaza overnight, before the ceasefire took effect. Palestinian witnesses confirmed that soldiers had left northern Gaza, where operations against rocket-launching squads had been focused. Palestinian President Mahmoud Abbas condemned the violations of the truce and the official Palestinian news agency, WAFA, said he had instructed the heads of security forces to ensure the truce held. It gave no details of how they would do so. Islamic Jihad claimed responsibility for launching at least five rockets into southern Israel and said it would not agree to a ceasefire unless Israeli military activity also ended in the occupied West Bank. No one was hurt in the attacks. The armed wing of the governing Hamas Islamic group said it fired two rockets, but Hamas political leaders pledged to obey the ceasefire. Al-Aqsa Martyrs Brigades, part of Abbas’s Fatah movement, also said they launched two rockets. Update 1: Israel’s CH2 TV News reports that 10 Qassam rockets have been fired into Israel since the start of the ‘ceasefire’. The BBC News reports that a ceasefire has been agreed in Gaza, which is most welcome as the majority of Gazans have suffered unnecessarily from the actions of Hamas and Islamic Jihad. Israelis should welcome the well-deserved peace and relative freedom from indiscriminate rockets dropping out of the sky at them. Several have been killed in recent weeks, even with their extensive early warning systems. Until now despite efforts by the Egyptian government to mediate the release of the kidnapped Israeli soldiers had been blocked by the Syrian and Iran governments. We can only hope that some deal has been struck and that the kidnapped soldiers are released, no more rockets are fired into Israel, that the IDF withdraw from Gaza and humanitarian aid pours in. The situation in Gaza is dire and it serves no purpose for it to worsen, so hopefully a joint government in the PA were recognised Israel and funding for humanitarian purposes resumes, with strict controls on the money to ensure that it doesn’t go towards arms or bombs. Or maybe I’m being a bit too optimistic? Trade unionists in the Middle East often face the most repressive regimes, theocracies, dictatorships, etc and yet they still struggle to protect the rights of their members. The possibility of arbitrary arrest or assassination is a constant worry to them. Sudanese Government Cynicism Baffles the UN, Why? Over the last few days, the BBC Radio Four midnight news has made much of the talks between the Sudanese government, the UN and the African Union over the issue of Darfur. A few days ago the unsuspecting listener may have assumed that Kofi Anand had pulled off a diplomatic masterstroke after months, if not years of prevarication on Darfur, by the Sudanese government. The UN pressed for a solid NATO mission in Darfur to protect refugees, after the failure of the African Union’s under resourced effort. The Sudanese government would have none of this, and so a compromise was eventually negotiated, that a beefed up African Union force would protect refugees in Darfur. Additionally, the Sudanese government promised to help protect refugees, and disarm the Janjaweed militia. 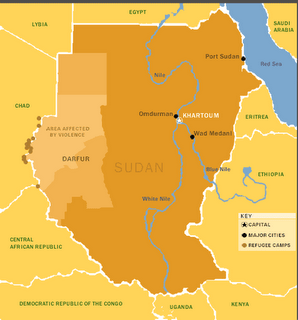 Whilst the negotiations were going on, the Janjaweed militia and Sudanese government forces launched a vicious military operation in Darfur. Even Kofi Anand must feel embarrassed at this level of cynicism. The Sudanese government has proven time after time that they will lie, cheat and say almost anything to obstruct humanitarian efforts in Darfur, even expelling the UN official concerned. The UN and interested countries should respond swiftly to these obstructive tactics by the Sudanese government with clear determination. They should move a sizeable NATO force into the Darfur region to protect refugees, come what may, and any obstacle should be pushed aside, or the UN will go the way of the League of Nations over Abyssinia. I doubt he would make a good James Bond, but Mr kiss kiss bang bang has certainly made an impression, the wrong one. Some people have argued that the current British antiwar movement (StWC) supports quasi-fascists (the insurgency) in Iraq, is home to a soft form of anti-Jewish racism (“we are all Hezbollah“) and even allows racist chants on their demonstrations (“Khaiber, Khaiber, Ya Yahud, Jaish Muhammad Safayahood”, which translates into, “Khaibar, Khaibar, O Jews, the army of Mohammed is coming for you”). Now you might think that the StWC would be a bit more careful with what they use on their web site? Of course, it may just be a mistake. It may just be that the Webmaster at StWC doesn’t know how to google a name or two. Or it may be that she/he doesn’t know what Holocaust revisionism is or who Andrew Winkler is [hint: he likes Zundel], but 3-5 minutes of research would have saved them considerable embarrassment. That is, if they are embarrassed? What next? Will StWC link to David Duke’s “antiwar” rantings or Pat Buchanan?